Provincial elections will be held in Quebec (Canada) on September 4, 2012. All 125 members of the provincial legislature, the National Assembly (Assemblée nationale), are elected in single-member constituencies (often known as ridings in Canadian English, or comtés/circonscriptions in French). Quebec’s political system, like that of every other province in Canada, is built on the Westminster system. The Premier of Quebec (called Prime Minister in French) and his government are responsible to the National Assembly and must retain its confidence in order to govern. With only two exceptions since 1867, all provincial elections in Quebec have resulted in majority governments, allowing the leader of the largest party to form a stable government. These elections will be disputed on a new map, following a provincial redistribution in 2011. 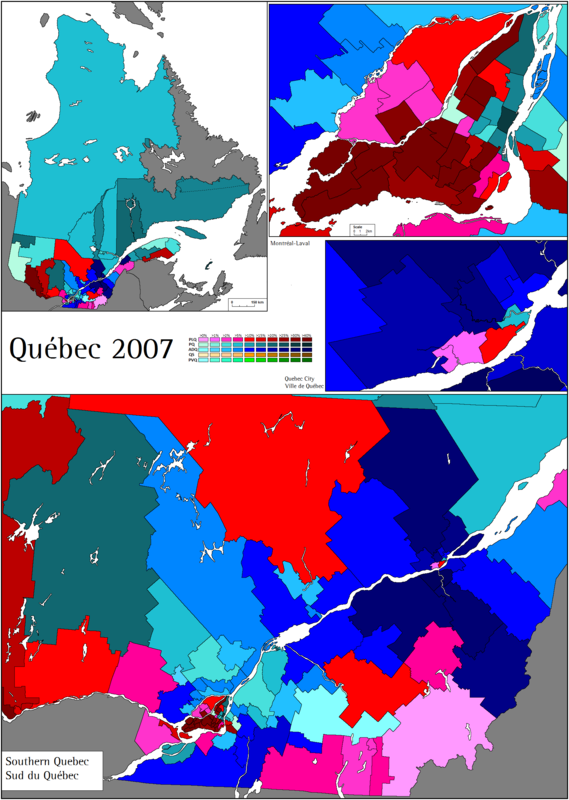 While the National Assembly retained 125 seats, there were changes in the regional distribution of seats with the elimination of some seats in less populous regions (Gaspésie, Bas-Saint-Laurent, Chaudières-Appalaches and Centre-du-Québec) and the creation of new seats in demographically vibrant regions (the suburban regions of Montérégie, Laval and Lanaudière). Other constituencies saw their borders altered somewhat, but there were no major changes to the look and layout of the electoral map otherwise. The DGEQ has maps of the new districts here, and has a very handy historical atlas (in Google Earth format) which shows the constituency maps since 1965. Quebec’s political history since Canadian Confederation in 1867 has been significantly influenced by the province’s unique place in Canada and North America. In a country where only a quarter or so of the population is Francophone, around 85% of Quebec’s 7.9 million inhabitants are Francophones. The issue of Quebec’s place within confederation has been one of the most important political issues in Quebec and Canada, and since the 1970s provincial politics are driven by the so-called “national question” – simply put, whether or not Quebec should be a sovereign, independent nation-state. Quebec nationalism is predominantly territorial or civic nationalism, even if the issue of language and Quebec’s ‘difference’ from the rest of Canada is indisociable from the national question. Furthermore, by and large, the Quebec nationalist movement is a largely secular, left-wing and progressive movement. However, when Quebec joined confederation as one of the founding provinces in 1867, there was no notion of Quebec as a secular community. What defined Quebec in 1867 was its heavily Roman Catholic and French-speaking population, who identified not with their province bur rather with their correligionists and fellow Francophones, including large French-speaking Catholic minorities in the Maritimes, Ontario and especially Manitoba. The idea that Quebec should separate from the rest of Canada was inexistent prior to the Conscription Crisis of 1917, and it would not be until the 1960s that separatism would find significant public support. The leaders of the Lower Canada Rebellion in 1837-1838 was the work of liberal reformers and nationalists who defined themselves as Canadian (canadiens) in contrast to most English-Canadians who defined themselves as loyal British subjects – and would continue doing so until at least the 1930s. Progressively, the liberal civic (Canadian) nationalism in Quebec would be replaced by a far more conservative brand of nationalism, sometimes styled clerico-nationalism. Until the 1960s, the Roman Catholic Church held tremendous religious but also social and political power in the province. Separation of church and state did not become a reality until the 1960s in Quebec. Following confederation and until at least the 1880s, Quebec politics both federally and provincially were dominated by the Conservative Party, which had the favours of the powerful clergy and Montreal’s protectionist business interests. At the provincial levels, the Conseratives ruled the province until 1887 (with the exception of a short-lived Liberal (PLQ) government between 1878 and 1879). However, the Conservatives’ stranglehold on provincial politics weakened under the weight of their own internal divisions, between a moderate faction close to Georges-Étienne Cartier (John A. Macdonald’s Quebec partner and fellow ‘Father of Confederation’) and an ultramontane clerical faction. External factors also precipitated the Conservative Party’s decline in Quebec in the late nineteenth century. Cartier’s death in 1873 was not a mortal blow but with his passing, the party lost its dominant figure. In 1885, the execution of Métis rebellion leader Louis Riel by Macdonald’s federal Tory government was deeply unpopular in Quebec and contributed to the victory of the PLQ, led by Honoré Mercier, in the 1886 provincial election. In contrast to the bland Conservative Premiers, Honoré Mercier was the first Premier of Quebec who had the stature of statesman. His government, although still close to the Catholic Church, represented the first expression of Quebecois demands for provincial autonomy. He was not alone in this movement for provincial autonomy. The terms of confederation in 1867 had created a very centralized federation, and several prominent Premiers including Oliver Mowat of Ontario demanded more provincial powers. A railroad scandal brought down Mercier’s government in 1891 and returned the Conservatives to power in 1892, but it proved to be the Conservative Party’s last hurrah in Quebec. Once again, it was largely external factors which hastened the provincial Conservatives’ final downfall. Macdonald’s death in 1891 severely weakened the federal Conservatives, and the Manitoba Schools Question (1890-1896, dealing with the public funding of separate religious schools including French Catholic schools in Manitoba) would fatally divide the party. Given that the Quebecois still identified primarily with their faith and language rather than their province, the Manitoba Schools Question was perceived as an affront to French Catholics and severely hurt the Conservatives at both levels. Federally, the Liberals led by Quebec’s native son Wilfrid Laurier used the divisions of the federal Tories on the Manitoba Schools Question to win the 1896 federal election. In 1897, the provincial Liberals handily defeated a divided and severely wounded Conservative government. After 1897, the PLQ would rule with only token opposition for the next 39 years, winning ample majorities in ten successive elections. In 1917, the federal Conservative government’s decision to implement conscription during World War I would be the fatal blow to whatever remained of the provincial Conservative Party. The Liberals abated their historical anti-clericalism and come to a silent agreement with the Catholic clergy, focusing rather on the economic development of Quebec and abandoning ambitious plans for education reform (education was heavily controlled by the Church). The two main avatars of the nearly four decades of Liberal dominance were Lomer Gouin (Premier, 1905-1920) and Louis-Alexandre Taschereau (Premier, 1920-1936). Both led laissez-faire policies favourable to businesses and particularly foreign investors (opponents accused the PLQ of selling the province to foreigners, mainly Americans), resulting in a strong economy and healthy finances in the years before 1929. Both Gouin and Taschereau toyed with the notions of provincial autonomy and would sometimes flex their muscle against Ottawa. Taschereau’s response to the Great Depression was slow and tepid, and the economic crisis proved to be his government’s downfall. In 1934, a group of PLQ dissidents led by Paul Gouin formed the Action libérale nationale (ALN). The ALN, influenced by the conservative nationalism of Lionel Groulx, was a corporatist and fairly nationalist party which supported an interventionist response to the economic crisis including the nationalization of electricity. In the 1935 election, the ALN allied with the Conservatives, led by Trois-Rivières lawyer Maurice Duplessis, to form a coalition styled Union nationale (UN). With 48 seats against 26 for the ALN and 16 for the Conservatives, Taschereau’s Liberals came close to defeat. Inevitable defeat was what awaited the PLQ government after Duplessis, a particularly cunning politician, revealed the extent of corruption in the government. Taschereau was forced to resign in June 1936 and replaced by Adélard Godbout, who was steamrolled by Duplessis’ UN in the August 1936 election (14 PLQ against 76 unionistes). Maurice Duplessis had won power by allying with the ambitious reformists of the ALN, and had adopted a similarly ambitious and reformist platform (fighting corruption and patronage, major economic reforms). However, as soon as he won power, the deceitful Duplessis quickly forgot any reformist drive he may have had, and in doing so dashed the hopes of most of his ephemeral reformist allies (most of the ALN’s leaders quickly left the UN). Duplessis adopted a much more assertive position in federal-provincial relations, and became known as a forceful defender of provincial autonomy against federal encroachment. As World War II erupted in September 1939, Duplessis – who opposed the Canadian war effort – quickly called snap elections for October 1939, hoping to profit from Quebec’s opposition to the war. However, Mackenzie King’s federal Liberal government – led by his Quebec lieutenant Ernest Lapointe – directly intervened in the provincial campaign by playing a slick game of the carrot and the stick: Ottawa promised that it would not implement conscription, but warned that if voters reelected Duplessis, the province would risk major political isolation as the Quebec federal Liberal caucus would withdraw from cabinet. The game worked, and Godbout’s Liberals staged a major comeback, taking 69 seats against only 15 for the UN. Godbout was a reformer who implemented a number of major reforms including giving women the right to vote (Quebec was the last province to do so, in 1940), making education for 6-14 years old mandatory and nationalizing a Montreal-area electricity firm to create Hydro-Québec. However, Godbout was much less vindicative than Duplessis in his relations with Ottawa. He did not oppose the federal government’s moves to take over provincial responsibilities (collecting the income tax) and he was hurt by the conscription crisis in 1944. Although they won the popular vote in the 1944 election, the PLQ lost the 1944 election to Duplessis and the UN, which won 48 out of 91 seats against 37 for the PLQ. Maurice Duplessis would rule Quebec until his death in 1959, winning three successive majority governments in 1948, 1952 and 1956. Duplessis’ fifteen year rule is referred to as la grande noirceur (the ‘great darkness’). Even if Quebec slowly inched forward with urbanization, the development of urban middle-classes and the rise of a more liberal intelligentsia, Duplessis’ government remained obstinately traditionalist, conservative (if not reactionary), authoritarian and clerical. He built an extremely powerful political machine, which acted as a powerful vehicle of graft and patronage. In the tradition of clerico-nationalism, his government took an assertive stance against the federal government, officially to defend provincial powers against federal centralization, in practice as a tool to consolidate his own political power. Duplessis is at the root of Quebec’s separate provincial income tax and the adoption of the current provincial flag. On economic matters, Duplessis favoured a laissez-faire approach and opposed the Keynesian welfare states which were taking root in Europe. He had no interest in developing social programs, and was stridently opposed to trade unions, suspecting them of being communist (a big anti-communist, his government passed the famous padlock law to ‘counter communist influence’). Somewhat in contradiction of his soft-nationalism against Ottawa, Duplessis aggressively developed the province through a close alliance with American investors (leading many to say that he was ‘selling the province’ to foreign investors). The provincial economy, especially in Montreal, was largely dominated by the powerful Anglophone minority, while the Francophone majority faced discrimination and socio-economic marginalization. Faced with mounting labour opposition to the alliance of local and American capital, the UN government broke up a number of strikes, the most memorable of which was the 1949 Asbestos Strike. Duplessis ruled in tandem with an omnipotent clergy which controlled education and healthcare. Together, the church and the UN state formed a tremendous bulwark against any kind of political evolution or ‘liberalization’. Duplessis died in September 1959 and was succeeded by Paul Sauvé, who promised major reforms. However, Sauvé, a man of some stature who could have modernized Quebec on his own terms, died only a few months after taking office, in January 1960. The hapless Antonio Barrette replaced him and led a divided party into the 1960 election, in which he struggled to measure up to Jean Lesage’s Liberals, who vowed to dramatically change the province. Even though the 1960 election was fairly close – the PLQ won 51 seats against 43 for the UN – Lesage had received a fairly clear mandate. The new Liberal governemnt was stacked with talented academics, intellectuals and reformers (including a young René Lévesque as public works, and later natural resources minister), and quickly set the tone for what would come. Lesage’s government passed a series of spectacular reforms including the creation of a modern public education system, the bases for Quebec’s public health insurance, and later the creation of the province’s distinct pension plan. The government grew as it assumed new roles such as education, healthcare but also the promotion of Quebec culture. At the cultural level, Quebec experienced a revolution – the so-called Quiet Revolution – with the Catholic Church seeing its power and influence collapse overnight. The largely rural, marginalized and morally traditionalistic French Catholic society was replaced by a new secular civil society, more progressive but also much more confident than the Catholic society of yesteryears. Quebec’s new society largely embraced the moral and sexual liberalism of the 1960s, while at the same time began to affirm its distinctiveness more forcefully. Indeed, Jean Lesage’s government was influenced by a strong nationalist tendency, which was not afraid of standing up to the federal government and enhancing Quebec’s image at the national and international level. The old tradition of provincial autonomy, defended by past PLQ and UN governments, was gradually transformed into a true nationalism. In retrospect, Lesage’s most nationalist action was certainly the nationalization of electricity. Godbout’s government had taken the first step in the 1940s with the creation of Hydro-Québec to replace a corrupt and inefficient private utilities company in the Montreal region. In 1962, René Lévesque urged an originally lukewarm Lesage to push through a full nationalization of Quebec’s hydro-electric resources, by consolidating all private electricity firms (a lot of them being owned by Anglophones) into a single public electricity monopoly (Hydro-Québec). Lesage called a snap election in 1962 on the issue, in which the Liberals ran on a clearly nationalist platform with the emblematic slogan, maîtres chez nous (masters in our own home). The PLQ received a decisive mandate from voters, with over 56% of the vote and 63 out of 95 seats. Inadvertently, however, Lesage’s bold reforms and the transformation of Quebecois society would encourage the growth of a nascent movement which demanded the independence of Quebec from Canada. In 1960, a group of left-leaning sovereigntists led by André D’Allemagne and Pierre Bourgault founded the RIN (Rassemblement pour l’indépendance nationale), which would become a political party in 1963. That same year, a group of young radicals founded the Front de libération du Québec (FLQ), a revolutionary movement which sought to win the independence of Quebec through violent means. The forces of nationalism unleased by Lesage during the Quiet Revolution are credited for the PLQ’s defeat in the 1966 election. Daniel Johnson Sr., the leader of the UN, adopted a very nationalist slogan during the 1966 election which seduced many nationalist voters: égalité ou indépendance (equality or independence). Even though the PLQ actually ran away with the popular vote in 1966 (47.3% against 40.8% for Johnson’s UN), the UN returned to power with 56 seats against 50 seats for the incumbent government. Bourgault’s RIN obtained 5.6% of the vote and a centre-right sovereigntist party (RN) won an additional 3.2%. Neither party won seats. Johnson’s election did not usher in a return to the Duplessis-UN darkness. In fact, Johnson continued and built on Lesage’s reforms, and he further enhanced Quebec’s standing on the national and international scene. Relations with Ottawa became frosty, especially after the election of Pierre Trudeau in 1968 (the day after violent clashes between police and sovereigntist activists in Montreal, on June 24 – Quebec’s national day). It was during Johnson’s short two-year tenure that Montreal hosted the successful Expo ’67 and that French President Charles de Gaulle pronounced his famous Vive le Québec libre speech in Montreal. However, Johnson’s death in 1968 and his replacement by Jean-Jacques Bertrand, a far less nationalist leader, marked the end for the UN. Bertrand was not as bold or ambitious as his predecessor, and he faced dissent within his own party. The 1970 elections were fought with the emergence of a new political party, the Parti québécois (PQ) founded by René Lévesque in 1968 after he had quit the PLQ in 1967, when they rejected his “sovereignty-association” project. Lévesque’s vision of independence (styled as sovereignty in traditional parlance) included a proposal for political and economic association with Canada, to create some sort of customs and possibly monetary union with the rest of Canada after the independence of Quebec. Following the party’s founding congress in 1968, Pierre Bourgault’s far more radical RIN gradually dissolved itself into the new party, providing the PQ with its ‘hardline’ wing (purs et durs). The PQ won 23.1% of the vote in the 1970 election, but managed only 7 seats. The PLQ, led by the young Robert Bourassa, staged a comeback by winning a huge majority (72/108 seats, 45% of the vote) while the UN collapsed, winning only 17 seats and 19.7% of the vote. 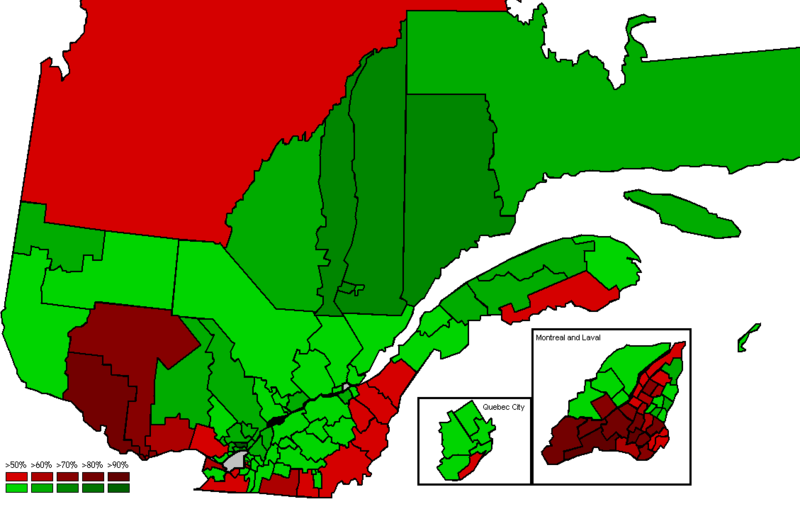 The social credit movement, on the heels of success in conservative rural Quebec at the federal level (SoCred won 26 seats in Quebec in the 1962 federal election), won 11% of the vote and 12 seats. Months after his election, Bourassa was confronted with Quebec’s biggest political and institutional crisis in its history. On October 5, a FLQ cell kidnapped British diplomat James Cross and, five days later, another FLQ cell kidnapped Pierre Laporte, the labour minister and one of the new cabinet’s highest ranking members. Bourassa, an inexperienced rookie Premier in 1970, was in way over his head in the October Crisis, and it was Prime Minister Pierre Trudeau who would take the forefront of the reaction to the October Crisis. On October 16, Ottawa invoked the War Measures Act, which gave authorities exceptional powers to suspend habeas corpus and civil liberties and arrest suspected FLQ sympathizers. Though James Cross was released after 60 days in captivity, Pierre Laporte was executed by his captors a week after his kidnapping. Laporte’s execution would destroy any base of public support for the FLQ and seal the fate of the terrorist organziation. Some of its leaders were granted safe passage to Cuba, while Laporte’s captors were later found and arrested by authorities. The development of hydro-electric resources in James Bay in northern Quebec was perhaps the most memorable achievement of Bourassa’s first government. His government kicked off the development of the province’s hydro-electric capacity in the north, through the construction of huge dams which remain the main source of electricity for the province to this day. In the social sphere, Bourassa’s government also passed Quebec’s current public health insurance law in 1970. Bourassa was reelected in 1973, winning all but 8 seats out of the 110 seats in the National Assembly. The PQ won 30.2%, but only 6 seats, though the UN’s collapse (the party lost all seats) allowed Lévesque’s party to form the official opposition (in the absence, however, of its leader, who did not win his riding). However, Bourassa’s second term was marked by a declining economic situation, major labour unrest in the public sector, the beginnings of language discord (the loi 22, which made French the official language of Quebec, went too far for the tastes of Anglophones and allophones, but did not go far enough for Francophone nationalists) and the debacle of the 1976 Montreal Olympics. In opposition, the PQ had moderated its rhetoric. In 1974, the party had adopted a resolution which stated that independence would be declared only after a referendum, and not unilaterally by the government after a PQ electoral victory. Bourassa called a snap election for November 1976. In one of the most famous provincial elections in Canadian history, René Lévesque’s PQ won a shockingly large majority. The PQ won 41.4% of the vote against 33.8% for the PLQ, but won a huge majority in the National Assembly with 71 out of 110 seats. The PLQ won only 26 seats. The UN made a modest recovery, winning 18% of the vote and 11 seats, and made major inroads with Anglophone voters. However, it would be the old beast’s last hurrah, like the Titanic’s stern sticking out of the water for a last time before plunging underwater. Lévesque’s victory sent a shockwave across Canada, raising fears in the rest of Canada that Quebec would separate. However, the PQ’s strategy was to prove its worth as a government before going to the people with the question of separation. The PQ had won on a platform of “good government” and turned immediate attention to fulfilling this pledge, with the introduction of a new law on party financing, an anti-scab law and the introduction of car insurance. That being said, the new government’s most memorable legislative achievement was the famous loi 101, the Charter of the French Language. Bill 101 replaced Bourassa’s Bill 22, making French the sole official language of Quebec. French became the official language of work in the public and private sector, in education, in advertising and in courts. The new bill restricted access to English schools to those children whose father and/or mother had received instruction in English. Federal-provincial relations in the 1970s and 1980s were marked by Prime Minister Pierre Trudeau’s vision of federalism and his ambition to patriate the constitution (Canada’s founding document, the BNA Act, was British legislation). Pierre Trudeau was the most vocal opponent of the Quebec sovereigntist movement, and was a strong advocate of centralized federalism. He rejected the idea that Canada was the result of the union of two nations, the English nation and the French nation, instead viewing Canadian confederation as the federation of ten equal provinces. In Quebec City, Trudeau faced provincial governments which were strong advocates of provincial autonomy and, after 1976, Quebec’s outright independence. Already in 1971, Bourassa had rejected Trudeau’s first attempt to patriate the constitution. Lévesque announced the organization of a referendum on his proposal for sovereignty-association in May 1980. While the YES had momentum at the campaign’s outset, the return of Pierre Trudeau’s Liberals to power in Ottawa following the 1980 election changed the cards. Trudeau took the lead of the NO campaign and promised Quebecois voters to reform the constitution if the NO won, an ambiguous message interpreted by some as a message that Ottawa was ready to satisfy Quebec’s demands. His promise certainly had some impact on the results, which saw the NO win handily with 59.6% of the vote. Despite the loss of the referendum, Lévesque’s government remained popular and was reelected with a stronger majority in the 1981 election, in which the PQ increased its share of the vote to nearly 50%+1 (49.3%). In the aftermath, Trudeau did live up to his promise of renewing the constitution, but certainly not in the way which some soft-nationalists might have hoped for. Trudeau’s goal in the patriation of the constitution had always been to adopt an amending formula (the basis of patriation itself – to make the BNA Act amendable by Canada only) and the addition of a Charter of Rights and Freedoms. Eight provinces, including Quebec and Alberta, opposed the inclusion of a charter and wanted an “opt out” clause. Trudeau threatened to patriate the constitution unilaterally, over the heads of the provinces. The Supreme Court ruled, in two judgements, that unilateral patriation was legal but at the same time ruled unilateral patriation was not in accordance with constitutional convention. The decision led to a conference of Premiers and Trudeau in November 1981. Trudeau, always the sly fox, broke up the so-called ‘gang of eight’ by luring Lévesque with an alternative proposal before the federal government reached an alternative compromise with all other provinces – except Quebec, which was kept (literally) in the dark – during the so-called “kitchen meeting” or “night of the long knives” (in Quebec). The other provinces agreed to a compromise which would take out their “opt out” clause in return for the inclusion of the notwithstanding clause in the Charter. Lévesque was not informed about this compromise until the next morning, and he refused to sign the deal. To this day, Quebec has not ratified the Canadian Constitution. Constitutional issues remained at the forefront of Canadian federalism during the 1980s. In 1984, Brian Mulroney’s Progressive Conservatives came to power in Ottawa, after a landslide victory which had been built, in part, on huge Tory inroads in Quebec, a province where the federal Conservatives had been dead in the water since 1967 (with the exception of the 1958 Diefslide). Mulroney had built his winning coalition with an appeal to Quebec nationalists, by promising to renew the constitution to include Quebec. Following Mulroney’s victory in September 1984, Lévesque declared that he was ready to negotiate with the federal government and put independence on the backburner in the meantime. This strategy, the so-called beau risque, proved controversial within his own party, with a sizable base of PQ purs et durs refusing to endorse Lévesque’s beau risque. Several cabinet ministers resigned in disagreement with the Lévesque strategy. In June 1985, crippled by the internal dissent in PQ ranks, an economic crisis and ongoing labour unrest in the public sector, Lévesque announced his resignation and was succeeded in September 1985 by Pierre-Marc Johnson, the son of the former UN Premier. A few weeks later, Johnson called an election. Even if the PQ dropped its focus on independence and shifted its campaign to economic issues, he was unable to salvage the sinking ship. Robert Bourassa, who had reclaimed the Liberal leadership in 1983, reclaimed his old office after a landslide victory in December 1985. The Liberals won 56% of the vote and 99 out of 122 seats – even though Bourassa was defeated his own riding (which he had won in a 1985 by-election). Bourassa’s primary objective was economic growth and healthier finances, and he led a fairly liberal economic policy. However, his government soon found itself at the core of Mulroney’s constitutional negotiations. In 1987, a major constitutional reform – the Lake Meech Accord – was reached after the other provinces and the federal government accepted Bourassa’s 5 preconditions. Meech Lake recognized Quebec as a ‘distinct society’, gave Quebec and the other provinces a veto power over future constitutional amendments, allowed provinces to “opt out” of federal programs, increased provincial powers over immigration and gave Quebec three judges on the Supreme Court who would have been chosen on the recommendation of the provincial government. The deal required the unanimous consent of all provinces within three years. The provincial legislature of Manitoba did not ratify Meech Lake, and Newfoundland subsequently receded its ratification. In 1989, Bourassa’s PLQ won reelection with a reduced majority (92/125 seats against 29 for the PQ). The 1989 election was marked by the remarkable success of the Equality Party, which won only 3.7% but elected 4 members from Montreal’s largely Anglophone West Island. In 1987, the Bourassa government had angered the Liberal Party’s Anglophone base with Bill 178, which enforced French unilingual advertising outside private businesses. Three Anglophone PLQ cabinet ministers had resigned in protest against Bill 178. Constitutional negotiations were given a second chance in 1992. The provinces came in agreement with the federal government in August 1992, signing the Charlottetown Accord. The Charlottetown Accord would have reinvented federal-provincial relations in Canada by reducing federal powers (most significantly, its spending power would have been limited and it would not have been able to attach conditions to fund transfers to provinces used for things such as education or health). The Senate would have been reformed to the West’s likings on a Triple-E model, but Quebec was compensated by a few goodies: distinct society, the 3 Supreme Court judges requirement and a clause which guaranteed Quebec a quarter of the seats in the House of Commons. The project was submitted to a nationwide referendum. In Quebec, sovereigntists such as PQ leader Jacques Parizeau and Lucien Bouchard, the former Tory cabinet minister who had left the cabinet to form the federal sovereigntist Bloc québécois (BQ), opposed the deal. The Quebecois opponents of the Accord claimed that it had not gone far enough to address Quebec’s grievances against the 1982 Constitution and had taken the form of a grocery list to please all sectional interests. In Canada, 54% of voters rejected the deal. In Quebec, the NO won 56.7%. The rejection of Meech Lake in 1990 and the unpopularity of the Charlottetown Accord relit sovereigntist feelings, after having been considered dead in the early 1980s. Bourassa became unpopular, and he announced his resignation in 1993, a short time after the BQ won a landslide in the province during the 1993 federal election. He was replaced by Daniel Johnson Jr., the son of the former UN Premier and the brother of the former PQ Premier. Quebec’s economic situation worsened in the early 1990s, and the province was faced with a large deficit which required the government to make major spending cuts and continue its privatization of state-owned companies. The 1994 election was closely fought – less than one percentage point separated the PQ and the PLQ (44.8% vs. 44.4% for the PLQ), but Jacques Parizeau’s PQ won a majority of the seats – 77 out of 125 against 47 Liberals. A new party, the Action démocratique du Québec (ADQ), won 6.5% and one seat. The ADQ had been founded in March 1994 by Jean Allaire, the Liberal architect of the Allaire Report which proposed a very decentralized federal model. The PLQ had sidelined Allaire’s plan, leading Allaire and a few others to found the ADQ, which supported the “autonomy” of Quebec within Canada and had right-wing positions on economic issues (balanced budget, reducing the size of the state). Allaire stepped down from the ADQ’s leadership a few months before the September 1994 election and was replaced by the young (25-year old) Mario Dumont, the former leader of the Liberal Party’s youth wing. Dumont was the ADQ’s only MNA after the 1994 election. Parizeau, a London-trained economist and passionate believer in the sovereigntist cause, had made no secret of his intention to organize a second referendum on independence if the PQ won. On October 30, 1995, the second referendum was held. Unlike in 1980, it was the NO which started out with the momentum, but the YES staged a major comeback, engineered in good part by Lucien Bouchard, who was a more popular campaigner than Parizeau. Support for independence surged to around 55% in the final week(s) before the vote, but the margin narrowed to a dead heat in the final days, including after a massive NO rally on October 27. In the end, the NO won – but by the skin of its teeth – with 50.6% of the vote. Parizeau resigned the next day, claiming that independence had been defeated only by “money and the ethnic vote”. Parizeau was succeeded by Lucien Bouchard in January 1996. With independence on the backburner for a while, the objective of the new Bouchard PQ government became deficit reduction, with the aim of attaining the fabled balanced budget (déficit-zero) before 2000. Traditionally a social democratic party, the PQ took a major turn to the right under Bouchard’s leadership. The government made sharp budget cuts including deep cuts in healthcare and controversial education reforms. In 1998, the PQ government won reelection with 76 seats against 48 seats for the Liberals and one seat for the ADQ. In April 1998, Jean Charest, the former leader of the federal Progressive Conservatives (Charest had been a Mulroney-era cabinet minister and one of two PC MPs to win reelection in the 1993 disaster), became the leader of the provincial Liberals. The PLQ actually won the popular vote (43.6% vs. 42.9% for the PQ, the ADQ won 11.8%) in the 1998 election. Bouchard’s government implemented very unpopular municipal amalgamations in 2000, which included the amalgamation of all muncipalities on the island of Montreal into a single municipality (the reforms also concerned, among others, Quebec City, Longueuil and Sherbrooke). Bouchard resigned in 2001 and was succeeded by Bernard Landry. Landry reoriented the PQ on a more social democratic course, notably with an anti-poverty law, and became a more vocal advocate of sovereignty than Bouchard had been. The government remained quite unpopular, but in 2001 and 2002, its unpopularity mostly benefited the ADQ, which won impressive victories in a string of by-elections in 2001 and allowed Mario Dumont to become a serious contender for Premier in 2002 and 2003. In the 2003 election campaign, however, the ADQ’s support collapsed, with voters uncomfortable with Dumont’s conservatism and inexperience as they learned more about him (courtesy of the PQ and Liberals). Jean Charest campaigned on reducing wait times in healthcare, major income tax cuts, a reduction in the size of the state and a promise to hold referendums on deamalgamation. The PLQ won the election with 46% of the vote and 76 seats, against 33% and 45 seats for the PQ. Dumont’s party increased its support to 18.2%, a gain of over 6.4% on the 1998 election, but the ADQ elected only three additional members to the National Assembly (for a total of 4 seats). Charest quickly became unpopular. His government did not follow suit on its promise to cut taxes, but the Charest government made major spending cuts, including controversial reductions in student loans and scholarships. The government also aimed to reduce the size of the state, by contracting out in the public sector and experimenting with public-private partnerships in areas such as healthcare. Charest faced the opposition of organized labour in the public sector, students, environmental groups and social movements. However, later in his term, Charest was able to benefit from the troubles of the new leader of the PQ, André Boisclair. The 2007 election was a very closely fought affair, opposing a fairly unpopular incumbent government to a mediocre opposition leader. Immigration was a major issue in the 2007 campaign, with the controversy over so-called “reasonable accommodations”. It is likely that Mario Dumont’s ADQ benefited from voters’ concerns over immigration, given that the ADQ surged – almost out of nowhere – to win 31% of the vote and 41 seats, placing a close second behind a severely weakened PLQ (48 seats and 33%) but placing ahead of the PQ, which won a calamitous 28% of the vote and only 36 seats. Charest was reelected, but for the first time in over 100 years, the new government was a minority government. Charest, a shrewd politician, was able to reinvent himself in a bit over a year. He improved his personal image, and his government finally passed those income tax cuts. Charest called a snap election for December 2008, arguing that he was best suited to govern the province during the economic crisis. Charest, proving his remarkable ability to bounce back from defeats, was reelected to a third term (unprecedented for any government since Duplessis) with a majority mandate. The Liberals won 42.1% and 66 seats against 35.2% for the PQ, which won 51 seats. The ADQ, propelled to official opposition with an untested team of paper candidates and rookies, performed badly in opposition – appearing as young amateurs – and it was badly defeated at the polls, winning only 16.4% and 7 seats. Québec solidaire (QS), a sovereigntist party to the PQ’s left, won its first seat with the election of the party’s spokesperson, Amir Khadir. The economy, corruption, post-secondary education and northern economic development have been the top issues in Quebec politics. Quebec has weathered the post-2008 economic crisis fairly well. The unemployment rate stood at 7.6% in July 2010, only 0.3% above the Canadian average. The government’s infrastructure projects, with much-needed work on roads and bridges, has helped to create jobs in the province and keep the provincial unemployment rate comparatively healthy (Quebec has historically tended to have higher unemployment than the rest of Canada). The province has had budget deficits since 2009, but the Charest government targets a balanced budget by 2013-2014. In the latest budget, the provincial deficit sat, better than expected, at $3.3 billion, representing 1% of the GDP. Quebec could be one of the first provinces to eliminate the deficits which have raked up since 2009 if it balances its budget by 2013-2014. The Charest government’s deficit reduction efforts meant fiscal restraint – job cuts in the provincial public sector and spending cuts – but also some revenue raising measures, notably an increase in the provincial sales tax in 2011 and again in 2012. The tax burden in Quebec remains the highest in the country, proponents would argue that this high tax burden is needed to finance the province’s very generous social programs including subsidized $7-per-day daycare and drug insurance. While Quebec’s deficit picture is better than that of other provinces – only Saskatchewan (which has a surplus) and Alberta had better government budget balances in 2010-2011 – the rising concern in Quebec is the provincial debt, which is the highest of all provinces (over 51% of the GDP). The Charest government created a “generations fund” to pay off the debt in the long term, and the last budget allocated some funds to this generations fund to help alleviate the provincial debt. While Charest’s economic record might be one thing which he has going for him, his government has been crippled by an unending flow of corruption allegations. The major allegations began in 2009 and have continued since then. In 2010, Charest’s former justice minister Marc Bellemare came out with allegations that the judicial nomination process was rife with political interference from PLQ fundraisers and cadres. The government created a public inquiry into the judicial appointments process, which in 2011 concluded that Bellemare had not received “collosal pressures” in his nomination of judges, but warned that the appointment process remained permeable to political interference. The government itself was rocked by the Tomassi scandal, after it was revealed that family minister Tony Tomassi had been granting permits for subsidized daycare places to PLQ donors and activists. Tomassi was expelled from cabinet and caucus in May 2010 before he was forced to resign from the National Assembly. The main corruption cases, however, involve Quebec’s construction industry. The construction industry in Quebec has long been known to be corrupt and infiltrated by organized crime, and construction costs in Quebec are higher than in any other province. The industry is ridden with corruption, graft, juicy kickback schemes and collusion. The corruption has a major political twist, given the close links which seem to exist between major construction contractors, engineering firms and the PLQ. Contractors and private companies, through various means, have been contributing substantial sums of money to the PLQ’s warchest, a practice which is illegal under Quebec law. Politicians – at all levels of government (the municipal level is particularly corrupt) – take illegal donations from major construction contractors; while organized crime maintains links and contacts within the construction industry, notably the FTQ-Construction (the main union for construction employees). The opposition parties called for a public enquiry into the construction industry and illegal party financing for months, but Charest refused to heed to their demands and preferred alternative routes. The PQ accussed Charest of being unwilling to bite the hand which fed him. Finally, in October 2011, the government announced a public enquiry into the construction industry. Since spring 2012, Quebec has been rocked by a major student strike which was sparked by the Liberal government’s decision to increase tuition fees by nearly 75% in five years. Tuition fees in Quebec were frozen at $1,668 between 1994 and 2007, at which point they grew by $100 per year to reach $2,168 in 2012. The government announced its intention to increase tuition costs by $256 per year over a five year period to reach $3,793 in 2017. Quebec currently has the lowest tuition fees of all provinces in Canada, and even after the planned fee hike, Quebec would still place in the lower tier of provinces in terms of tuition fees. The government claims that this tuition increase is required to alleviate the underfinancing of the province’s universities. However, student unions found the hike unacceptable, in part also because of serious concerns about the rising burden of student debt. Student strikes and protests began in February and intensified throughout the spring, but have died down somewhat during the summer and the election campaign. In some cases, protests turned violent as demonstrators attacked private businesses or police forces. Some 20 or so individuals have been injured and over 2,500 persons have been arrested. Neither side have been able (or willing) to come to an agreement or even move past meeting each other, turning the student movement into a widespread political and social crisis. The government’s inability to deal with it and some apparent divisions in government ranks, as evidenced by the recent resignation of the education minister and deputy prime minister, likely forced Charest to call early elections. In May, the government adopted a controversial law – Bill 78 – which restricts freedom of assembly and protest without prior police approval. Some have questioned the constitutionality of the law. One of the government’s most ambitious projects is the Plan Nord, a plan to develop the economy of northern Quebec and create jobs. This plan, presented by Charest as the “largest project in a generation” involves substantial public and private investments into the construction of mines, the development of renewable energy and the construction of new transportation infrastructures. The government claims that the plan would not only develop the economy of the largely barren but natural resource-rich northern regions of the province, but also created a large number of jobs. Opposition parties are concerned by the low royalties which the province would get from new mining companies, and there are concerns about “selling off” Quebec’s unexploited natural resources to foreign-owned mining companies. At the partisan level, the PQ went through a major internal crisis in 2011 while the political right in Quebec got a face lift. The PQ has been led since 2007 by Pauline Marois, a long-time politician who has a record as a fairly technocratic cabinet minister (she has served in most high-profile cabinet portfolios). Marois is a strong-willed leader, but she is also a fairly divisive figure and has always faced some dissent from other péquistes. In June 2011, the PQ and her leadership were tested in a major internal crisis after four PQ MNAs quit the party to protest the party’s decision to support a government bill which immunized the controversial construction of a new hockey stadium in Quebec City from judicial proceedings. However, beyond this reason, these resignations also symbolized the unease of certain of the PQ’s purs et durs with Marois’ decision to put the national question on the backburner for a little while. The ranks of those who stepped down included Pierre Curzi and Lisette Lapointe (the wife of former Premier Parizeau, himself a critic of Marois), two well-known hardline sovereigntists within the PQ. Jean-Martin Aussant, another of those who stepped down in June 2011, went on to create his own party – Option nationale (ON), a hardline sovereigntist party, in October 2011. After its collapse in the 2008 election, the ADQ lost its leader, Mario Dumont. Dumont had been the face of the party since 2008 and remained, even after the ADQ’s surge in 2007, the only prominent member of the party. The leadership contest to succeed him turned into a farce, leading the losing candidate to leave the party and force the party to hold a second leadership contest. The party’s numbers recovered somewhat in 2010 and 2011, returning to their 2008 levels, due to the PLQ’s decling popularity and the PQ’s internal wranglings. However, the fate of the ADQ and Quebec’s political right in 2010 and 2011 rested on one man, François Legault. Legault was in charge of Air Transat, a major airline, until 1997. He was elected as a PQ MNA in the 1998 elected and served as education and later health minister in the Bouchard and Landry cabinets until 2003. Reelected in 2008, Legault resigned from office in 2009. He had progressively disattached himself from the PQ’s raison-d’être, sovereignty. In October 2011, Legault ended speculation and created his own party, the Coalition avenir Québec (CAQ). The Quebec Liberal Party (PLQ) is Quebec’s oldest political party. In the polarized field of Quebec politics, the PLQ is a big-tent federalist party which has opposed the independence of Quebec and supports Quebec’s continued place in Canada. However, despite being a federalist party, the PLQ’s vision of federalism has always been quite distant from the Trudeau-era federal Liberal vision of federalism. Robert Bourassa was not a sovereigntist, but he was clearly a nationalist. During the constitutional debates of the late 1980s and early 1990s, Bourassa defended the recognition of Quebec as a ‘distinct society’ and he generally agreed with Brian Mulroney’s vision of decentralized federalism. In his first term in office, Bourassa’s relations with Pierre Trudeau were acrimonious, with Trudeau patronizing Bourassa. Under Jean Charest’s leadership, the PLQ has been slightly less affirmative against Ottawa and the PQ has often accussed Charest of poorly defending Quebec’s interests against the federal government. It is true that there were no constitutional debates during Charest’s term, and neither Quebec nor Ottawa had any interest in opening the Pandora’s box which is the Canadian Constitution. However, Charest’s relations with Stephen Harper (since 2006) have been fairly friend but not particularly warm. Furthermore, the PLQ has made no efforts to loosen the province’s language laws, passed by the first PQ government. Charest is often boasting about how his government has enforced language laws, and Bourassa alienated Anglophones in 1989 with Bill 178. As a big-tent party, the PLQ unites right and left-wing federalists who might support either the federal Liberals, Conservatives or even New Democrats at the federal level. However, ideologically, the PLQ has a slight lean to the centre-right, especially under Charest’s leadership. Bourassa’s government led a fairly liberal economic policy which included many privatizations and early spending cuts. Charest’s economic policies have been even more right-wing. He won the 2003 election on a platform of tax cuts for the middle-class (which he would not implement until his second term) and vowed to reduce the size of the state. In office, he experimented with private-public partnerships in healthcare and the private sector now plays a significant role in healthcare in the province. He also implemented some concepts of New Public Management in office. That being said, for many on the right, the PLQ is not a ‘truly’ right-wing party. It has not shied away from government intervention in the economy, and it has raised taxes in the past. The PLQ’s core electorate are minorities – linguistic and ethnic minorities. It receives well over 60-65% of the vote from Quebec’s English-speaking minority and allophones (those whose mother tongue is a non-official language), both groups who strongly oppose Quebec independence. The PLQ’s margins in constituencies with a large percentage of Anglo- or allophones is huge, even if voter turnout in these constituencies is very low. The PLQ’s strong base with these voters has advantages and disadvantages for the party’s electoral performances. The Anglophone and allophone vote for the PLQ is almost a given, which provides the PLQ with a good floor both in the popular vote and the seat county. On the other hand, this rock-solid base of support means that the PLQ suffers from an inefficient vote distribution. It can rake up 65-80% of the vote in constituencies with a very large percentage of linguistic or ethnic minorities, but in the case of a tied popular vote – like in 1994 or 1998, the PLQ tends to be at a disadvantage, unless, of course, the Francophone vote is particularly divided, like in 2007. Besides this federalist base, the PLQ also polls better with wealthier and/or older Francophones who tend to be cooler towards the idea of independence. Jean Charest is campaigning with a very tough record to defend. Even if he might have an advantage on the economy and jobs, his record on healthcare or education is mediocre and he carries around a huge weight with him – the lingering suspicions of deep corruption within the Liberal Party. The PLQ’s numbers have tanked since the 2008 election, polling third with the Francophone vote and coming dangerously close to hit its floor. The PLQ could have capitalized on the social disturbances linked to the student movement this spring, and it originally did, but the controversial Bill 78 and its incapacity to respond to the student strikes destroyed any chance it had of gaining political capital from the movement. Beyond all this is the fact that Charest has been in power for 9 years, and there is major voter fatigue with his government. Even if Charest is a strong debater and a tested politician who has a knack for miraculously rebounding from the depths of hell, this is certainly one of Charest’s toughest races in his career and one where a huge rebound seems almost impossible. At the core of Charest’s campaign is the economy and the Plan Nord. Charest has hammered in his “strong management” of the economy, boasting his record – even if it is not all that great – on job creation and public finances. He wants to create 250,000 jobs and reduce unemployment to 6% if he wins reelection. Charest says that his Plan Nord is the biggest project in a generation and he wants it to be the cornerstone of his political legacy. He claims that some 20,000 jobs a year could come out of the plan. The PLQ had trouble finding prominent candidates, given the low standings of the party in opinion polls. It did dig out a few 2007 ADQ rookies, including Linda Lapointe (Groulx) and Pascal Beaupré (Joliette), and a former federal Liberal MP, Eleni Bakopanos (Crémazie). The PLQ’s candidacy news were rather marked by retirements: Michelle Courchesne, the latest education minister and Monique Gagnon-Tremblay, in office since 1985 and incumbent minister of international relations. The Parti Québécois (PQ) is the main political representative of the Quebec sovereigntist movement. The party’s raison-d’être has always been the independence of Quebec, and the province’s sovereignty remains its top priority. PQ governments since 1976 have held two referendums on the independence of Quebec, the first in 1980 and the second in 1995, but both were defeated (the last one by less than 1%). The Quebec sovereigntist movement is a civil territorial nationalist movement, which means that the PQ’s project for independence is not overtly ethnic or linguistic based (even if critics may claim that it is), unlike some past nationalist movements in Quebec. The PQ’s project is the independence of Quebec as a territorial entity, not the independence of a French-speaking state in North America which would include more than just Quebec. However, linguistic and ethnic issues and independence are all interconnected, to the point where one might go with the other. The PQ has presented itself as the best defender of Quebec’s distinct culture and the French language. One of its most famous legislative achievement was Bill 101 in 1976, the law which still regulates the use of French and other languages in the province. At various times in its history, the PQ has taken controversial stances on linguistic or cultural issues which have led critics to accuse it of fanning the flames of intolerance and xenophobia. Within the party, there have been some divisions, most famously in 1984 (and 2011? ), over the prioritization of independence. The party includes a sizable pur et dur faction which has always placed independence as its top priority, regardless of circumstances, and has rejected any attempts to put sovereignty in the backrooms for a little while. Ideologically, the PQ is a social democratic, centre-left party. PQ governments are behind some of the province’s generous social programs, including car insurance or $5 (now $7)-per-day daycares. The first PQ government under René Lévesque followed a fairly clear social democratic orientation, but the party shifted quite far to the right (on economic issues) under Premier Lucien Bouchard. After the defeat of the sovereigntist cause in 1995, the PQ government reoriented itself to balancing the budget, which it did by major spending cuts including unpopular cuts and layoffs in the healthcare system. Under his successor, Bernard Landry, the PQ shifted back towards its centre-left origins, but Landry’s hapless successor, André Boisclair (2005-2007) was less social democratic. The party’s current leader, Pauline Marois, appears to be close(r) to the PQ’s centre-left, social democratic roots. The PQ’s main base is, of course, with francophone voters, though it does not command the level of support that the PLQ commands with Anglo/allophone voters. In regional terms, the sovereigntist movement has been strong in the Saguenay-Lac St. Jean region, in most of Gaspésie, Abitibi and large swathes of the north shore of the St. Lawrence (Laurenties, Lanaudière, Mauricie). In the 2007 election, one of the main factors behind the PQ’s spectacular collapse was its wipe out in the middle-class suburban and exurban commuter belt of the north shore of Montreal-Laval, where the ADQ swept nearly everything. 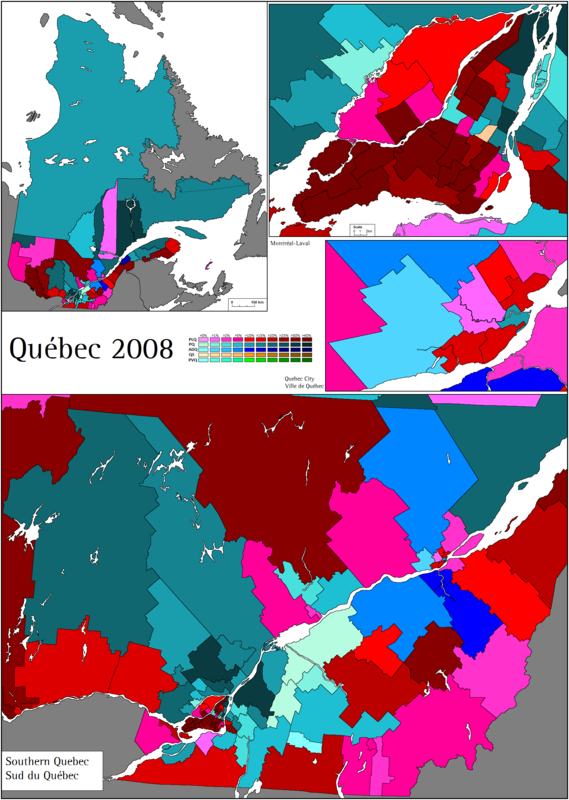 The ADQ also made major gains in similar exurban middle-class commuter belt communities on the south shore of Montreal, where the PQ is traditionally strong. In the 2008 election, the PQ regained most of its old strongholds on the north and south shores. The PQ has traditionally been strong in heavily Francophone low-income urban areas. As of today, there does not appear to be a realistic chance for Quebec to become an independent, sovereign country in the near future. Popular support for independence is low, at its floor (a bit over a third of voters), and there is certainly very little appetite for a third referendum in the foreseeable future. Voters are becoming increasingly tired of the old, divisive issues of independence/referendums/sovereignty, and while a large majority of Quebecois are keen on upholding their rights and values within Canada, comparatively few of them still actively support independence. The NDP’s sweep of Quebec in the 2011 federal election was indicative of this fairly widespread sentiment of soft-nationalism without accompanying sovereigntism. The 2011 federal campaign showed that the NDP started running away with the game in Quebec when the Bloc, desperate to turn a tilting ship around after the first signs of the Orange Crush, resorted to old sovereigntist rhetoric and in the process only sped up the NDP’s ascent. The PQ is placed in a very fragile position with the declining appetite for sovereignty. It must satisfy the hardliners within the party and the sovereigntist movement who would not accept a péquiste campaign which places sovereignty on the shelves, but it must be careful not to overplay the old question of a referendum lest they fancy handing the Liberals a golden issue. Marois’ campaign this year has been intentionally ambiguous and unclear on the issue of when a PQ government would hold a referendum. She officially states that she would hold one only when she would have “winning conditions”, a line already used by the PQ government after the 1995 defeat. On the other hand, to please the hardliners who threatened her leadership in 2011, she has promised an ambiguous “popular initiative referendum” which would allow for there to be a vote on the issue if 850,000 voters (15% of the electorate) signed a petition. The popular initiative referendum has turned into a nightmare for the PQ, with Marois hinting that there could be certain circumstances in which she would refuse to hold a popular initiative referendum even if 15% of voters asked for one. In the meantime, the PQ has said that its strategy, if elected, would be to engage Ottawa in a game of tug-of-war. It wants to gain full control over programs such as employment insurance which are currently federal jurisdiction, and it would use a refusal on Harper’s behalf as a tool to boost support for sovereignty. Language and identity have featured prominently in Marois’ campaign. The PQ wants to adopt a new, tougher Charter of the French Language which would subject businesses with over 10 employees (rather than 50 under the current law) to the law and which would bar Francophones and allophones from attending English-language CEGEPs. The PQ wants to adopt a charte de la laïcité which would ban the public display of any distinctive religious symbol by public employees, but Marois stepped into controversy when she said that she would not remove the crucifix from the National Assembly. Finally, her campaign created a firestorm when she said that she would prevent Anglophones and allophones who do not have an appropriate knowledge of French from running in elections. Critics have accused the PQ of playing on ethnonationalism and fanning the flames of intolerance. The PQ’s economic platform includes the creation of 15,000 new places in daycares, a temporary freeze in tuition fees at their 2012 level and abolishing Charest’s controversial health tax. To compensate for these new expenses, the PQ wants to increase taxes on high incomes (over $130,000 per year) and limiting the growth in government expenditures to 2.4% a year. The PQ attracted a number of star candidates this year including notably two journalists, Jean-François Lisée (Rosemont) and Pierre Duchesne (Borduas), and 2o-year old former student leader Léo Bureau-Blouin (Laval-des-Rapides). The Coalition Avenir Québec (CAQ) was created in 2011 by François Legault, a former businessman who served in PQ cabinets under Lucien Bouchard and Bernard Landry. Legault resigned from the National Assembly in 2009 and entertained suspense about his political ambitions for over a year afterwards, with much speculation as to whether or not he would create a new party. In February 2011, Legault laid the foundations for a new party, which was officially registered in November. Legault had distanced himself from sovereigntism, claiming that the national question had become outdated and archaic. The CAQ seeks a middle ground between doctrinaire federalism and sovereigntism, aiming to prioritize more urgent issues, such as the economy, while placing the national question on the shelves. The CAQ wants a ten-year moratorium on any referendum, and Legault recently said that he would vote NO in a future referendum (before backtracking and saying that he would vote NO but would not defend federalism). On economic matters, the CAQ generally lies on the centre-right. The CAQ is in many aspects similar to Mario Dumont’s ADQ. The ADQ represented a similar ambiguity on the divisive national question, seeking an ‘autonomist’ or soft-nationalist middle ground between the PLQ’s doctrinaire federalism and the PQ’s doctrinaire sovereigntism. Both were populist and right-leaning on economic matters, the ADQ perhaps more so than Legault’s CAQ. The ADQ would have been squeezed out of existence by the CAQ, and there was little rationale for two ideologically similar parties to coexist separately. In January 2012, the ADQ officially merged with the CAQ. At dissolution, the CAQ held nine seats: the four remaining ADQ MNAs, two former ADQ MNAs sitting as independents and three former PQ members. It is likely that most of the CAQ’s core electorate comes from the old ADQ, even though it is incorrect to assume that all 2008 ADQ voters are backing the CAQ. In terms of regional support, the ADQ was strongest in suburban Quebec City and the south shore of Quebec City, the Chaudières-Appalaches region. This conservative region, where the federal Conservatives have done well, has been described by one political scientist as the Québec mou (‘soft’ Quebec) or the Québec tranquille (the ‘quiet’ or ‘calm’ Quebec). It is a bit of an enigmatic region because it is one of the most heavily French-speaking regions in Canada, yet the sovereigntist cause has found only limited backing in this part of the province. The Beauce region, the most conservative part of Quebec , has a reputation for being an entrepreneurial and ‘pro-business’ right-wing region. Some have thought that this region’s sociological makeup – it is lily-white, older, more blue-collar, fairly poor and socio-politically marginalized from the rest of the province – might explain its voting patterns. At the outset, the CAQ’s creation was greeted by a short-lived outburst of popular support, which was built on little else than a vague desire for “change” and a “third way” between two tired old parties. Leading the PLQ and PQ in the fall of 2011, the CAQ collapsed to third place as early as January 2012. Legault’s actual political platform, besides “change” and putting sovereignty on the shelves, was always very vague and proposed little of substance. His political opponents still accuse him of trying to play to all sides of the spectrum at the same time, and being intentionally vague about his policies. Despite proximity with some of the ADQ’s old proposals, many on the right still feel relatively uneasy about Legault. Legault has led a “straight-talking” populist campaign, talking about the need to “clean up” politics. Voters have judged him to be the most competent leader on corruption and integrity issues, and he certainly made a splash when he managed to get the former Montreal police chief-turned-whistle blower Jacques Duchesneau to run for the CAQ (in Saint-Jérôme, a PQ seat). On economic issues, Legault strikes a more centre-right tone. He wants to devote 100% of the royalties from natural resources to pay off the province’s debt, he generally supported the government during the student strike on tuition fees, he has promised immediate tax cuts totaling $1,000 and supports private-public partnerships in healthcare. He has vowed time and time again that a CAQ government would “shake things up” and “clean up waste” by abolishing school boards , health centres and by cutting a lot of jobs in the public sector. His more confrontational attitude against trade unions have won him the ire of Quebec’s two main unions, the FTQ and CSN. He says that just as the PLQ is in cahoots with “corrupt business interests”, the PQ is tied to its “corrupt union” supporters. Legault’s opponent, both Charest and his former cabinet colleague Pauline Marois, have accused him on several occasions of being an unreliable flip-flopper who besides seeking to pander to all ideologies has changed allegiances from sovereigntism to de facto federalism. To what extent, however, is Legault’s “big flip-flop” a negative for him? At its outsets, one of the CAQ’s main assets beyond being a vague vehicle for change, was that it represented a type of non-sovereigntist soft-nationalism which is quite attractive to a significant proportion of the Quebecois electorate which has grown tired of the divisive national question and the strict division between the doctrinaire federalism and sovereigntism of the PLQ and PQ. The federal NDP’s victory in Quebec in May 2011, as mentioned above, must be interpreted as being reflective of this state of mind rather than any huge NDP inroads with the core of the sovereigntist base. Despite the original excitement which surrounded the creation of the CAQ, Legault had trouble attracting well-known candidates to his label. In the Argenteuil by-election, the CAQ had a star candidate with former Bloc MP Mario Laframboise. In this campaign, Legault boasts about his “trio” of incorruptibles candidates with a reputation for being anti-corruption crusaders: the whistleblower and former police boss Jacques Duchesneau (Saint-Jérôme), the former president of the Ordre des ingénieurs du Québec Maud Cohen (Laval-des-Rapides) and incumbent ADQ-CAQ MNA Sylvie Roy (Arthabaska). The other big CAQ star is Dr. Gaétan Barrette, the former president of the provincial specialist doctor’s union, running in Terrebonne. The party’s leader has chosen to run in L’Assomption, a traditionally péquiste seat in the growing exurbs on the north shore of Montreal. Québec solidaire (QS) is a left-wing sovereigntist party founded in 2006 by the merger of two left-wing parties, including the UFP which was an electoral coalition made up of the remnants of the provincial NDP and the Communist Party. The party has no leader, but is defined by its two spokespersons, feminist activist Françoise David and Iranian-born Amir Khadir. Like the PQ, QS supports the independence of Quebec, which has opened QS to accusations of being a spoiler which divided the sovereigntist vote. However, while the PQ sees sovereignty as an end in itself, QS seems sovereignty as a mean to its ends. It believes that its platform of social justice, environmental protection, defense of women’s rights and upholding Quebec’s culture and language can only be achieved in an independent Quebec. QS also has a different method of reaching this ultimate goal. If elected, it would hold a constituent assembly, which would decide, among others, the political status of Quebec (while the QS would support independence, it would not necessarily result in independence). One or more proposals for a constitutional text for Quebec would then be submitted to the people in a referendum. QS is the first major threat to the PQ from its left. While QS won a relatively modest 3.8% in the last provincial election in 2008, its profile received a major boost with Amir Khadir’s victory in the downtown Montreal constituency of Mercier. As a third party, QS has the benefit of having a part of its votes concentrated in two ridings – Mercier and Gouin – two gentrified bobo constituencies in downtown Montreal. QS’ platform is clearly to the left of the PQ. It received attention during the student strikes, where it unambiguously supported the student movement and now supports free tuition. 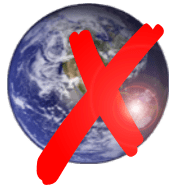 The party supports electoral reform (MMP), abolishing privatization in health care, reducing greenhouse gases by 40% by 2020, developing renewable energies and making income taxes more progressive. It is also concerned by issues such as the French language, Quebec culture, reducing poverty and women’s rights. QS co-leader Françoise David participated in the main leaders’ debate, in which she performed very strongly. She was lauded for her clear, coherent and concise answers and for attempting to inject other issues, such as education and poverty, into the debate. The emergence of QS as a major political actor has worried the PQ, which has claimed that QS divides the sovereigntist vote. Option nationale (ON) is a new party founded in 2011 by Jean-Martin Aussant, an ex-PQ MNA. Aussant left the PQ to sit as an independent in June 2011, contending that the PQ had abandoned the issue of sovereignty in favour of “electoralist groupthink”. ON places sovereignty as its first objective, and it considers that a ON government would be a mandate for Quebec to declare de facto sovereignty, at which point a constitution could be drafted and submitted to the people in a referendum to allow for formal, de jure sovereignty. ON is not the first ‘hardline’ rival to the PQ which has criticized the PQ’s wait-and-see approach to independence, but it is the first of these ‘hardline’ groupings which has become a fairly significant minor threat to the PQ. Aussant received a major boost during the campaign when former Premier Jacques Parizeau, whose dislike for Marois is no secret, endorsed him. Parizeau’s wife, Lisette Lapointe, a retiring independent (ex-PQ) MNA, had already endorsed ON. Besides independence, ON has a very left-wing platform. It wants to nationalize natural resources, free tuition (from preschool to the doctorate, with conditions) and supports limiting the role of the private sector in health care. To achieve the de facto sovereignty of Quebec, a ON government would seek to gain control over all taxes payed and all powers from Ottawa. ON is ideologically similar to QS, despite certain differences between the two parties, notably on the prioritization of sovereignty. However, both parties agreed to a mini-deal for the elections. QS is not running a candidate against Aussant in his constituency of Nicolet-Bécancour, while ON is not running a candidate against David in Gouin. ON has managed to field 121 candidates (125 seats in total), a very impressive result for a young party with a limited organization. The Green Party of Quebec (PVQ) is running only 66 candidates. The Greens were reborn in 2001 after a short-lived stint as a sovereigntist party in 1989 (2% of the vote). In 2007, the Greens ran 108 candidates and won 3.9% of the vote, but they ran only 80 candidates and won 2.2% in 2008. The Green Party’s position on the national question is very unclear. The PVQ’s potential electorate is naturally attracted to QS, meaning that the PVQ’s only real base is with Anglophone voters who do not vote Liberal. In 2007 and 2008, it placed a very distant second to the Liberals in a number of West Island Liberal citadels, winning about 15% of the vote in Notre-Dame-de-Grâce. There are a handful of other parties, including a new Conservative Party led by former federal Conservative MP Luc Harvey. The PCQ is running only 27 candidates. The federal NDP does not have a provincial party in Quebec, though a provincial NDP with formal ties to the federal party existed between 1963 and 1989, at which point the NPDQ and the federal NDP broke all formal ties. The provincial NDP had become a left-wing sovereigntist party. However, after the success of the federal NDP in Quebec in May 2011, there has been some speculation about the recreation of a provincial party. NDP leader Thomas Mulcair recently announced that there would be a provincial party for the next provincial election. The left-federalist side of the spectrum is largely unrepresented in Quebec, given that the PLQ leans to the right. A new left-federalist party, the UCQ, is running 20 candidates this year. Polls in this campaign, thus far, have indicated a close three-way contest with the PQ maintaining a narrow but consistent advantage over its two major rivals. The absence of consistent polling, most notably a daily tracking poll, is quite frustrating. We are dependent on three pollsters, of which only two are tested in the field of Quebec provincial elections. A poll from Léger, which has a long track record in the province, gave the PQ 33% support against 28% for the CAQ and 27% for the PLQ. QS received 7%, ON and the Greens were at 2% apiece. A new poll from CROP gave the PQ 33%, with the CAQ at 28% and the PLQ down to 26%. For comparison, in the 2008 election, the Liberals won 42.1% of the vote against 35.2% for the PQ and 16.4% for the ADQ. On such a split of the vote, the PQ would be able to eek out a bare absolute majority in the National Assembly, but any margin smaller than 5% between the top two parties would likely result in a minority government. Too Close to Call’s projector, which can be modified, predicts 64 seats (majority: 63) for the PQ against 32 for the Liberals and 27 for the CAQ (+ 2 for QS) on the basis of the latest poll from Léger. Using the CROP data, the PQ would have 66 seats against 28 apiece for the CAQ and Liberals, with QS winning two seats and Aussant (ON) holding his seat. Obviously the only thing which matters is the seat count, but an absolute majority on something like 33% of the vote would be a Pyrrhic victory for the PQ. While losing the 2008 election, the PQ had won 35% of the vote, which had been considered a strong showing. In the 2003 election, in which the Liberals won a convincing victory, the PQ won only 33% of the vote. In the 2007 disaster, the PQ was reduced to a mere 28% of the vote. Pauline Marois is not an asset for the PQ. Even if she is a tough leader who managed to survive the onslaught of dissidence and polling disasters in the summer of 2011, she is not perceived favourably by most voters and she has failed to inspire many voters. Her campaign has been surprisingly weak and though she performed decently both in the all-leader debate and two individual “one-on-one” debates with Charest and Legault, she did not score any knockout punches. In the past week or so, the PQ campaign has gone from kerfuffle to kerfuffle: the “charter of laïcité“, the “popular initiative referendum”, the ban on Anglo/allophone candidates with poor French language skills or just recently with the mini-brouhaha about “conservative sovereigntists” (she told them to vote PLQ or CAQ, but later backtracked by saying that she misunderstood the question). She has been forced to clarify her positions, backtrack from previous statements, contradict things she said in the past or correct the pronouncements of other people in the PQ. If Marois and the PQ wins, it will not only be with an unconvincing popular vote mandate but it will be in spite of Pauline Marois. Against Jean Charest, reviled by over 60% of voters, she weighs up as a good ‘least worst’ option, though Legault now poses a major threat to her for this dubious honour. A PQ government would not be a mandate for a third referendum within a short time frame, which is something which Marois understands quite well. Voters are more concerned about bread-and-butter issues in this election than they are with picking fights with Ottawa (even if Harper is hardly popular in the province) or talking about a third referendum. Even if the PQ is performing quite poorly, the PLQ’s performance is set to be disastrous. In existence since confederation, the worst Liberal result was 33.1% of the vote in the 2007 election. It has never dropped below 30% of the vote, yet it is quite likely that the PLQ could be winning less than 30% of the vote on September 4. The Liberals are hitting their floor at a rapid pace. Jean Charest’s extreme unpopularity is the top reason for the PLQ’s apparent decrepitude. Even if he is a good campaigner, a strong politician and winning debater, the lingering dark cloud of corruption which hovers over his head (added to his unpopular record in government and a botched response to the student crisis) have prevented him to bounce back for a final time. The race for first remains very close, and there is still a chance that if the PQ sheds support to its left and right, then the PLQ could stand a chance at bouncing back to win a minority government. The Liberals certainly hoped that the PQ’s decision to jump head first into the murky waters of linguistic issues and referendums would provide them with a golden opportunity to coalesce the federalist vote against the PQ, but thus far if there is any PLQ bump due to the PQ’s poor campaign, it has not been picked up by pollsters. Even if the party places third in the popular vote, it could salvage official opposition status. At 27% or so support, the Liberals are very much relegated to their core non-Francophone/minority vote. Léger had the PLQ polling only 18% and distant third with Francophone voters, a number which would spell disaster for many PLQ incumbents in heavily Franco seats. With Anglo and allophone voters, the PLQ still retains over 65% support. The CAQ was making some inroads with this rock-solid Liberal electorate, and it now polls roughly 15-20% with these voters (clearly not insignificant) but the solid Liberal vote with this electorate is not in any sort of doubt or jeopardy. While in cases of a tied popular vote for first place, the PLQ’s vote distribution is inefficient, in the potential case of a tied popular vote for second-third place, the PLQ has an advantage over the CAQ because it can count on at least 20 seats off the bat from the West Island and the Outaouais. However, the PLQ would be swept out in most of central Quebec, the Eastern Townships, metro QC City and Abitibi. Charest is seriously threatened in his own riding, Sherbrooke. His seat, which he has held since the 1998 election, is not a traditional Liberal stronghold and he has never won by fantastic margins. In 2007, the TV networks famously announced his defeat in Sherbrooke before doing a Florida 2000 and retracting the call. He won by 1,332 votes in 2007 (36.6% vs. 32.9% for the PQ) and increased his majority to 2,314 votes in 2008 (45.2% vs. 37.6% for the PQ). The PQ is running a strong and popular candidate against Charest, former Bloc MP Serge Cardin (defeated by a NDP rookie in 2009). Two riding polls in Sherbrooke have given Cardin a lead over 10% over Charest, with the anti-Charest vote apparently coalescing heavily behind Cardin. Sherbrooke is notable for having the largest student population of any major city in Quebec, though with the election being held on September 4, student turnout across Quebec will likely be fairly low. Polls have shown that there is a strong generational cleavage in this election: the Liberals are still dominant with voters aged over 65, but their numbers with the youngest cohort have totally tanked (below 20%). The major question mark in this election is the CAQ. To begin with, there is the unknown of to which extent the 2008 ADQ vote can be assumed to be a good predictor, universally, of the CAQ’s floor in this election. While polls have shown that most 2008 ADQ voters are backing the CAQ, the transfer between the two parties is not perfect at 100% and would be, at best, only 75%. That being said, the structure of the CAQ’s electorate seems similar to the ADQ/centre-right vote in Quebec. It has been strongest in metro Quebec City, where it is currently ahead of the PLQ and PQ, and it will likely perform as strongly as the ADQ in the Québec tranquille to the south of the capital. There has been some disagreements as to where the CAQ’s “new voters” (besides 2008 ADQ voters) have come from. The June by-elections and polling trends would seem to indicate that the Liberals bled a considerable number of their 2008 voters to the CAQ, but others have contended that the CAQ has drawn more or less equally from the PQ and PLQ. I vaguely remember a second-choice poll not too long ago in which the CAQ’s voters split their second choices equally between the PQ and PLQ, while Forum Research (even though some of its number are often fishy…) told us that the CAQ drew 21% of 2008 PLQ voters and 15% of 2008 PQ voters, in addition to 58% of 2008 ADQ voters. As mentioned above, public opinion greeted the CAQ’s creation last fall by placing it far ahead of the field with some 35% support, but the CAQ’s honeymoon with voters was short-lived. They dropped to the low 20s by the new year. However, Legault led a strong campaign, with his straight-talking populism and his tough talk of “shaking things up” and “cleaning up” likely striking a chord with many voters. The CAQ progressively started roaring back into serious contention, if not for power then at least for official opposition. Legault is the most popular of the three main leaders – though that only means that his approval and disapproval numbers are tied rather than being deeply in the red (like they are for Charest and Marois), and to most voters, the CAQ is the best representative of change and the best party to fight corruption. While a week and a bit is definitely a short time frame for the CAQ to actually win the election, it is a real possibility. Quebec has a knack for surprising election results, with ADQ-2007 and NDP-2011 being the two most recent example. While at this juncture it would be very difficult for the CAQ to make further inroads with the Liberals, given how the Liberal vote is coming primarily from the Anglos and allophones, the CAQ can hope that QS grinds into PQ support to close the gap between first and second. Recently, the media narrative is that Legault is Marois’ main threat, and if this narrative holds on, it is not impossible to see the anti-PQ/anti-Marois/anti-independence vote coalesce behind Legault and the CAQ to defeat the PQ. That being said, the nature of PLQ support at this point means that it would require, on the CAQ’s behalf, major inroads with ethnic and linguistic minorities. Much ink has already been spilled on the CAQ’s potential with Anglophone voters and Legault has courted their votes somewhat, but Charest has been careful not to forget the PLQ base and reminded them of their beef with one of Legault’s top planks – abolishing school boards. Even if the CAQ can pull upwards of 20% with non-Francophones, it would probably not be enough to wrestle many seats away from the PLQ, especially on the West Island. QS has been pulling 6-8% in this campaign, which despite being below the heights reached by the party during the pre-campaign (up to 10) are still excellent numbers. The party’s main objective in this election is to win a second seat. In Gouin, Françoise David is in her third attempt to take down PQ incumbent Nicolas Girard, who defeated her in 2008 by a 9.3% margin. QS’ changes in Gouin are on a knife’s edge, but with QS likely to score most of its gains on Montreal Island and David likely to receive a major boost from her strong performance in the leader’s debate, she might be the narrow favourite. Nicolas Girard is a fairly high-profile PQ incumbent, but David clearly built up her profile and notoriety tons with the debate. While the road from one seat to two seats is fairly straightforward for QS, the road from a second seat to a third seat is quite difficult and would require a significant swing in QS’ favour, and 6-8% in the province would not be enough (unless the gains from 2008 are all on Montreal Island). QS’ third seat would probably be Sainte-Marie-Saint-Jacques, where Manon Massé received 15.4% of the vote in 2008 (she had won 22% in a 2006 by-election). But the PQ won 46.6% in that seat, hence requiring QS to eat up a 31% PQ majority. Laurier-Dorion (13% QS, 30% winner-QS margin) and Hochelaga-Maisonneuve (12.9% QS, 41% winner-QS margin) are the fourth and fifth strongest QS seats in the province, but even more out of reach for QS. ON managed to field an impressive amount of candidates, nearly a full slate, but their only real objective in this election is likely to reelect their leader, Jean-Martin Aussant in his riding of Nicolet-Bécancour. When Aussant quit the PQ to create his new party, a majority of the local PQ riding association followed in his lead. There have already been two riding polls out of his riding (loads of salt and all that), one of them had him a close second behind the CAQ while the other had him leading the field. The unexpected public endorsement of Jacques Parizeau might boost Aussant’s chances to win reelection. Provincially, ON with 121 candidates will certainly easily beat the Greens and their 66 candidates. This election is still very much up in the air because of the number of real three-way contests, and the high potential for many ‘fluke’ victories or holds because of the three-way tossups in some seats. The real battleground will likely be the 450 area code (the north and south shore suburbs of Montreal, excluding Laval) with a good number of three-way races, PQ-CAQ battles or PQ-PLQ contests. The north shore (Laurentides and Lanaudière) will be make-or-break for the CAQ, which will need to match the ADQ’s impressive 2007 performance in these traditionally solidly PQ ridings if it wants to place second in the seat count or win the election altogether. The CAQ has three of its star candidates in these crucial ridings: Legault himself in L’Assomption, a PQ-held seat with a 28.6% margin in 2008 between the PQ and ADQ (on notional results) but which has no defending PQ incumbent; Dr. Barrette in Terrebonne, a seat with a defending PQ incumbent which had a 24% margin between PQ and ADQ in 2008; and Duchesneau in Saint-Jérôme, a seat with a defending PQ incumbent who had a 22% majority over the ADQ in 2008. The north shore also features two other key races for the CAQ in Blainville and Deux-Montagnes, where PQ-turned-CAQ MNAs Daniel Ratthé and Benoit Charette are seeking reelection for the CAQ. The south shore is slightly less exciting in terms of close races, and the CAQ’s impact will be more limited. The Liberals will certainly hold La Pinière (Brossard, a seat with a very large non-Franco population) and might squeak through in Laporte (Saint-Lambert/Greenfield Park); the PQ is safe in Marie-Victorin, Taillon and Vachon. In the new constituency of Sanguinet, PQ-turned-CAQ incumbent François Rebello is running for reelection under the colours of Legault’s party, and the CAQ might have a shot in La Prairie as well. In the exurban and rural reaches of south shore (Montérégie), the CAQ will definitely be a major threat to PQ incumbents in Iberville, Saint-Hyacinthe, Saint-Jean while it threatens the Liberals in Huntingdon. CROP’s crosstabs showed a very close contest between the PQ and the CAQ in the 450, with the PQ (37%) leading Legault’s party by only two points (35%), with the Liberals out of the match entirely (21%). On these numbers, the PLQ would be dead in the water outside Brossard (La Pinière), Vaudreuil and probably Laporte; while a good number of both north and south shore suburban and exurban ridings would be on a knife’s edge between the PQ and CAQ, holding the keys to a PQ majority government or a CAQ official opposition/surprise victory. Outside the suburban regions of the 450, the CAQ’s surge has likely placed the ridings of Joliette and Berthier (both in Lanaudière), previously assumed to be solidly péquiste, into serious contention between the PQ and the CAQ. Laval could see some close (three-way) races in all but one of the island’s six ridings. Laval-des-Rapides is certainly the most closely fought battle, given that it pits a Liberal incumbent against PQ and CAQ star candidates. The seat has a thin 6.4% notional Liberal majority, but the CAQ’s Maud Cohen will certainly poll much better than the ADQ’s paltry 10% in 2008. Additionally, Fabre, Vimont, Sainte-Rose and Mille-Îles should all see some very closely disputed three-way battles, with PLQ incumbents in very tenuous positions. Montreal itself is extremely polarized, meaning that despite the big number of seats up for grabs on the island, only a few (five at most) are even remotely competitive. Gouin, where the QS’ David faces the PQ incumbent for a third rematch, is the most closely disputed races in Montreal. The PQ has a shot at gaining Saint-Henri-Sainte-Anne (8.8% PLQ majority), Laurier-Dorion (9.1% PLQ majority),Verdun (12.4% PLQ majority) or Anjou-Louis-Riel (16% PLQ majority) from the Liberals, but it is quite possible that the PLQ could still walk out with a win in these four seats even if it does poorly in the province as a whole. If the PLQ sinks below 30 seats, it is likely that a majority of the new Liberal caucus will hail from Montreal Island. The CAQ, like the ADQ, has not made a breakthrough on the island. There are no ridings, as far as I know, on Montreal Island, where the CAQ holds a solid chance of winning or at least coming close to first place. Central Quebec and the Eastern Townships will also be a key region with major contests to follow and three-way battles. Besides the Premier’s race in Sherbrooke, which will monopolize all attention on September 4, there is also Jean-Martin Aussant’s battle for reelection in Nicolet-Bécancour. For the CAQ, one of their top incumbents (and one of Legault’s trio of incorruptibles), Sylvie Roy, saw her constituency abolished by redistricting, forcing her to run in Arthabaska against Liberal incumbent Claude Bachand, who has a 14.3% majority over the ADQ on 2008 notional results. In the core of the Québec tranquille, the CAQ will be seeking to defeat two Liberal incumbents in Beauce-Sud and Bellechasse, two seats which the Liberals gained from the ADQ in 2008 with a thin majority. Between the PQ and PLQ in the Eastern Townships, the contest in Richmond between the PQ’s Etienne-Alexis Boucher (the incumbent in the old seat of Johnson) and Karine Vallières, the daughter of retiring PLQ incumbent Yvon Vallières (Richmond) is getting some serious attention. The Liberals have a small 5% majority on notional results from 2008, but the PQ needs to make gains in the towns of Asbestos and Richmond which went heavily for the Liberals in 2008. The PQ is also a major threat to PLQ incumbents in Orford, Saint-François and Mégantic. The CAQ could be a major factor in Johnson, Drummond-Bois-Francs, Lotbinière-Frontenac and Nicolet-Bécancour, ridings where the ADQ was dominant in 2007 and strong in 2008. In Mauricie, located on the north shore between Montreal and Quebec, the CAQ will be hoping to gain seats which the ADQ had won in 2007 but which the PQ or PLQ had regained in 2008. Trois-Rivières is a key three-way contest, the PLQ is defending with Danielle St-Amand (who won the seat, Premier Duplessis’ old political base, from the ADQ in 2008), and the PQ has a well-known candidate with Djemila Benhabib, famous for her activism in favour of secularism (and at the centre of a firestorm with the very traditionalist conservative mayor of Saguenay Jean Tremblay). A poll showed Benhabib up on the Liberals, but a more recent poll showed the PLQ ahead. The CAQ, furthermore, could very well creep up from behind in Trois-Rivières or other seats in the regions, including Maskinongé and Champlain. In metro Quebec City, all polling has shown the CAQ with a strong advantage over the Liberals, who have maintained second place (but with their usual crummy numbers), with the PQ in a close third. If these numbers hold up for the CAQ, it would be a major upset if they did not gain ridings such as Lévis (where they appear to have a fairly prominent candidate), Vanier-Les Rivières, Montmorency, Charlesbourg or Portneuf. In Louis-Hébert, incumbent Liberal cabinet minister Sam Hamad is seriously threatened by the CAQ, leaving only health minister Yves Bolduc in a fairly good position in Jean-Talon. In Taschereau, the PQ’s only foothold in Quebec City, PQ incumbent Agnès Maltais faces Clément Gignac, the Liberal natural resources minister (who is an incumbent for a Montreal-area riding, but running in Quebec City this year), but she should have no trouble winning. In the Bas-Saint-Laurent, the contests in Côte-du-Sud and Rivière-du-Loup-Témiscouata, two ridings whose boundaries changed considerably, are closely fought. The Liberals are the defending incumbents in both, but they face a strong challenge from the CAQ in Côte-du-Sud, which includes part of the old riding of Montmagny-L’Islet, which the ADQ won in 2007; and the PQ fancies its chances in Rivière-du-Loup-Témiscouata but there is an outside chance for a CAQ upset. In the Gaspésie region, the PQ has the ambition of taking out three PLQ incumbents. In Gaspé and the Îles-de-la-Madeleine, this seems like a very reasonable proposition given the decrepitude of the Liberals. However, taking out the Liberals in Bonaventure will be more difficult. The PLQ held that seat without too much trouble in a by-election in November, and while the PLQ’s fortunes have only worsened since last fall, it still seems like Bonaventure would go down with the Liberal ship. In the Saguenay, the PQ will regain Dubuc from the Liberals and hold all other seats. In Abitibi, the two PLQ incumbents in Abitibi-Est and Rouyn-Noranda-Témiscamingue look like goners. The Outaouais region should prove one of the last Liberal holdouts, with the PQ requiring major swings to overturn the large Liberal majorities in a region where the PQ has been shut-out since 1981. However, with the state of the PLQ, the PQ has a fighting chance in two seats in the region: Hull and Papineau, two seats where the Liberals won over 50% of the vote in the last election. Quebec’s election on September 4 promises a very closely fought contest between three parties, and the unpredictable nature of Quebec politics certainly promises us a good deal of surprises. But Quebec’s election will also hold consequences beyond the provincial border of Quebec. The election of a PQ government would change power relations between Quebec and Ottawa in a fairly dramatic way.